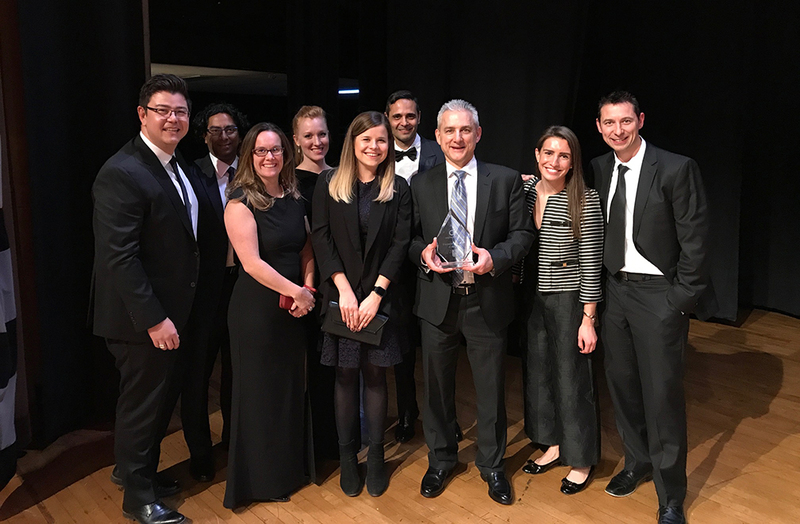 TORONTO - December 6, 2017 - RBC is proud to be recognized as the Financial Institution of the Year by the Digital Finance Institute at the 2017 Canadian FinTech & AI Awards on November 27. The award is presented to the Canadian financial institution, bank or credit union that has had a positive impact on financial technology in Canada. It recognizes technology created for financial institutions, partnerships that further the development of fintech at the institutional level, and internal innovative initiatives that engage employees and support innovation designed in Canada. RBC received the award in recognition for championing internal innovation and investing in innovation partnerships that will help drive the future success of Canada. In 2017, RBC established Borealis AI with labs at the MaRS Discovery District in Toronto and at the University of Alberta in Edmonton to push the boundaries of the science around machine learning. In partnership with NEXT Canada and Magna, RBC created NextAI, a global innovation program for artificial intelligence-related ventures. We're also working with leading universities and organizations to support the wider tech ecosystem in Canada and to partner with the best, brightest and boldest minds we can find. This includes building a $3-million start-up accelerator, ONRamp, at the University of Toronto, for student and graduate entrepreneurs to develop and commercialize ideas. RBC was also recognized for achieving technology milestones over the past year, including earning top honours in customer satisfaction for the RBC Mobile Banking App from J.D. Power; being the first Canadian bank to launch both Interac e-Transfer using Siri voice commands and enable bill payments using Siri; launching NOMI Insights and NOMI Find & Save; and developing a blockchain-based shadow ledger for payments between the U.S. and Canada. The Digital Finance Institute is a Vancouver-based think tank created for the next generation of financial services. They address issues in respect of the nexus between financial innovation, digital finance policy and regulation, financial inclusion and women in financial technology. The Canadian FinTech & AI Awards were started in 2015 by the Digital Finance Institute to recognize and celebrate Canadian innovation in financial technology and more recently, in artificial intelligence. The Awards bring together, on an annual basis, Canada’s technology leaders in finance to celebrate each other and support Canadian technology in finance from coast to coast to coast.